You’d never know it, looking at my butterfly collection and garage full of in-line skates, but I used to study theology. A central idea in that soup of ideas is “the atonement,” the belief that the death of Jesus saved the human race from something. For 2,000 years theologians have disagreed how the death of one man could possibly save a whole race–which it clearly hasn’t done–and there are at least five good theories. But I am against them all. True atonement is a creative act of grace, requires no payment in kind, and no one needs to die. This story tells you why. A few weeks ago I interviewed applicants for a new position, as my personal assistant. I use these occasions to pry into people’s lives. I ask, “What was the best moment in your work life so far?” and “What has been the worst moment ?” These are horribly intrusive, but I enjoy watching people grasp for the inexpressible. That’s enough to thwart any nosy employer, but not me. So, what did you do? I asked. “I stole an Aerosmith CD from a store. Toys in the Attic. And I got caught.” Now here was a tender conscience. The next weekend, I was comped some Aerosmith tickets and went to the United Center in Chicago to hear the legendary band. The huge auditorium has endless corridors and back rooms, and soon I found myself in some restricted area. Three or four burly guys demanded that I return to the fan seats. I’m trying to find water, I said, I have a kidney condition. That did it. Two guys urge me to follow them and the next thing I am in a room draped with silk sheets and stocked with ice buckets and make-up. I was in someone’s green room and a guard was thrusting a bottle of water in my had. No one was going to get a kidney stone attack on his watch. Tom Hamilton walks in and sits down in one of the lush chairs. 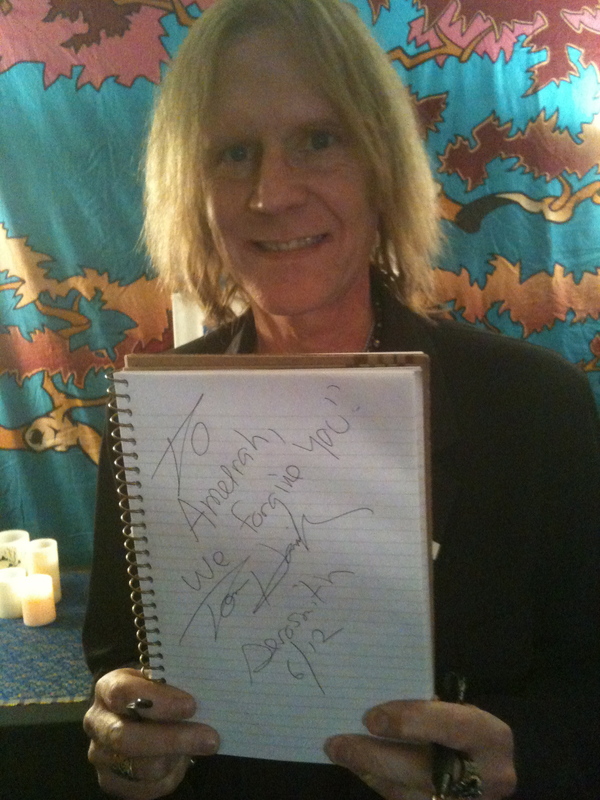 He says hi and just assumes I have every right to be backstage with America’s greatest rock bassist. I was trippin’. I have a story, I stutter between gulps. I tell him about Ameerah. “Well, we can’t have that,” he retorts. Tom reaches for a pen and pad, and starts writing, lefty style. He tears off the sheet and hands it to me. “I’m sorry but I have to start getting ready. We go on soon.” That’s my clue to leave. I stuff the paper in my back pocket and hurry out to find my seat. I have never been an autograph hunter. What would I tell people–that I had a piece of paper signed by Mr Sweet Emotion? So what! But here is my new theory of atonement….